2018 Ducati Panigale V4. Picture credits - Ducati. Submit more pictures. It is called Panigale V4 and it marks a new and important chapter in Ducati�s history, a �symphony� of performance and emotions that�s 100% Italian. Panigale V4 is the first mass-produced Ducati motorcycle to be equipped with a 4-cylinder engine, closely derived from the Desmosedici of the MotoGP. battery and a titanium Ducati Performance by Akrapovi and #269; exhaust will take you and 162 kg of racing technology straight to the chequered flag. Rear suspension: Fully adjustable Sachs unit. Aluminium single-sided swingarm. Ask questions Join the 18 Ducati Panigale V4 discussion group or the general Ducati discussion group. Get a list of related motorbikes before you buy this Ducati. Inspect technical data. Look at photos. Read the riders' comments at the bike's discussion group. And check out the bike's reliability, repair costs, etc. 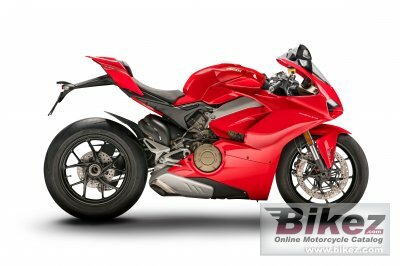 Show any 2018 Ducati Panigale V4 for sale on our Bikez.biz Motorcycle Classifieds. You can also sign up for e-mail notification when such bikes are advertised in the future. And advertise your old MC for sale. Our efficient ads are free. You are also welcome to read and submit motorcycle reviews.